The dual rear cameras have almost become the norm in our modern-day smartphones, but seems like the phonemakers continue to one up each other. That’s why we’re seeing more and more handsets shipping triple-camera setups on the back. And if that wasn’t enough, there’s a smartphone with four snappers on the back. Let that sink in. We’re of course talking about the Samsung Galaxy A9. Multiple sensors will ideally allow users to have more options while shooting pictures, so we though it’d interesting to take a look at all the smartphones that are available with three or more rear sensors. Huawei spearheaded the triple-camera trend with the P20 Pro. The handset comes equipped with a Leica Triple Camera setup consisting of a 40MP RGB sensor, a 20MP Monochrome sensor and an 8MP Telephoto sensor that offers 3X optical zoom and 5X hybrid zoom. That apart, the camera features include Laser autofocus, Action shooting, scene recognition technology, 960 fps slo-mo and AI features. As far as the front camera is concerned, the Huawei P20 Pro comes with a 24MP Sony IMX576 sensor with f/2.0 aperture. At the fascia, the handset features a 6.1-inch FHD+ LG OLED display and is powered by an octa-core Kirin 970 chipset coupled with 6GB of RAM. The Galaxy A7 sports three vertically-aligned snappers on the rear. This setup consists of a 24-megapixel camera, an 8-megapixel ultra wide sensor, and a 5-megapixel depth-sensing unit. The selfie camera is rated at 24-megapixels and ships with LED flash and Pro Lighting Mode. Under the hood lies Samsung Exynos 7885 processor paired with 4GB / 6GB RAM. The display is a 6-inch FHD+ Super AMOLED panel. Samsung has moved the fingerprint sensor to the side and the device is available in Blue, Gold or Black colors. The Galaxy A9 is the world’s first smartphone with a quad-camera array on its back. Like the A7, the handset offers the normal, ultra-wide and depth sensors, and adds a telephoto lens rated at 10-megapixels. Taking care of selfies is a 24MP unit. The phone ships with a 6.3-inch full HD+ display and draws power from Qualcomm’s Snapdragon 660 chipset and 6 gigs RAM. The A9 comes in attractive colours and is powered by a respectable 3,800mAh cell. The Huawei Mate 20 Pro borrows the triple camera setup from the P20 Pro. It features the same Leica branded 40-megapixel primary sensor, an 8-megapixel secondary sensor, however, the 20MP ultra monochrome is replaced by a 20MP ultra wide-angle sensor. Up front, the handset comes with a 24MP shooter. Otherwise, the Mate 20 Pro is a full-blown flagship as it flaunts a 6.39-inch display with a QHD+ resolution. The device comes equipped with the latest 7nm Kirin 980 SoC, which works in tandem with 6GB of RAM. The Mate 20 Pro is among the most powerful flagships in terms of the battery life as it’s fuelled by a 4,200mAh battery. And that’s not all, along with Super Charge and wireless charge functionality, the device can wirelessly charge other phones too. The OPPO R17 Pro comes equipped with a 6.4-inch display. Under the hood, the phone is powered by the Qualcomm Snapdragon 710 SoC paired with 8GB of RAM. The triple rear camera module on the R17 Pro is made up of a 12MP shooter with a dual aperture of f/1.5 and f/2.4, a 20MP snapper with f/2.6 aperture, and a third 3D DOF depth sensor. Meanwhile, the front camera on the is a 25-megapixel unit. Fueling the package is a 3,700mAh battery that supports proprietary VOOC Flash Charge technology. The device is all set to launch in India on December 4th. 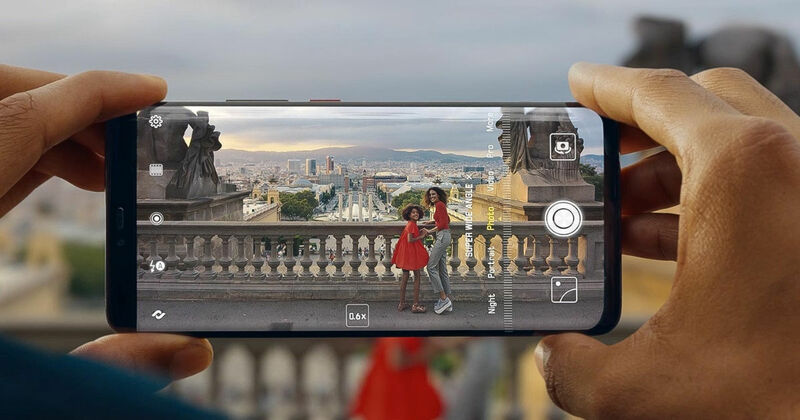 LG has also jumped into the triple-camera bandwagon with the V40 ThinQ. The flagships offers a 16-megapixel super wide-angle lens, a 12-megapixel telephoto shooter, and a 12-megapixel standard sensor. On the front, the device comes with an 8MP camera alongside a 5MP wide-angle sensor. LG’s V40 ThinQ also features a Boombox speaker with DTS:X 3D Surround Sound and a 32-bit DAC headphone jack. At the fascia, the device flaunts a 6.4-inch QHD+ display with an aspect ratio of 19:5:9. Under the hood, the phone comes powered by the latest Qualcomm Snapdragon 845 chipset paired with 6GB of RAM. It seems that the triple cameras (or more) are soon to become the staple feature in the near future. Did any of these smartphones excite the photographer in you? Let us know in the comment box below.